curl is a a command line tool that allows to transfer data across the network. It supports lots of protocols out of the box, including HTTP, HTTPS, FTP, FTPS, SFTP, IMAP, SMTP, POP3, and many more. 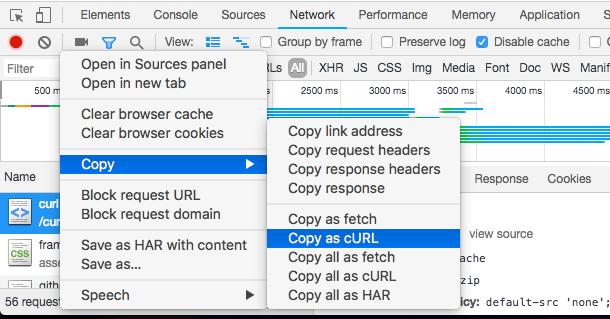 When it comes to debugging network requests, curl is one of the best tools you can find. It’s one of those tools that once you know how to use you always get back to. A programmer’s best friend. It’s universal, it runs on Linux, Mac, Windows. Refer to the official installation guide to install it on your system. Fun fact: the author and maintainer of curl, swedish, was awarded by the king of Sweden for the contributions that his work (curl and libcurl) did to the computing world. Let’s dive into some of the commands and operations that you are most likely to want to perform when working with HTTP requests. Those examples involve working with HTTP, the most popular protocol. Using -X POST will perform a POST request. In this case, the application/x-www-form-urlencoded Content-Type is sent. Instead of posting data URL-encoded, like in the example above, you might want to send JSON. The user agent tells the server which client is performing the request. By default curl sends the curl/<version> user agent, like: curl/7.54.0.